Ending your cruise in Sydney? Save on taxi fares and ensure a hassle-free transfer to your hotel by pre-booking your arrival transfer online. 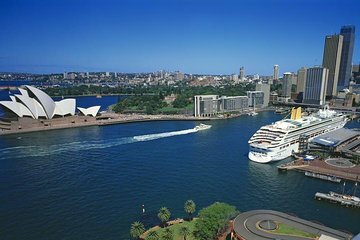 When your cruise ends, your driver will meet you at your Sydney cruise port terminal, help with your luggage and drive you to your Sydney CBD hotel by air-conditioned minivan or coach. It’s an easy, cost-effective option that’s available for all arrival cruises, so you can concentrate on enjoying your vacation. I disembarked earlier and waited outside for my shuttle. Driver was easy to find as he was holding a Go Sydney Shuttle sign. We did get off the ship earlier than expected. 8am I called and asked if they could come any earlier and they said no - at 9. At 9:20 they finally arrived. The other two in our party actually left their luggage with us and walked! When they finally came - he wanted to charge us extra for their suitcases until I clarified that we had paid for them and they didn't wait! There were tons of other taxis and shuttles - that if we had known we would never have booked this. You may want to look at another vendor. Driver arrived on time but not even one smile. Transfer was OK but had to wait for other people at the airport for some time before we finally got on the mini bus. Next time I will book a private transfer. We disembarked earlier than our pick up time but our shuttle was there early so no waiting or having to call. Got us to our hotel with no problems. Right price too. The driver who according to the voucher should have picked us up at 9 am showed up at 9:35and informed us that we are not on his list and have to wait for the next bus that will arrive shortly. We 4 people and another couple who were waiting with us and received same response decided we will not wait on the pier for the next shutle to arrive after having waited for 35 minutes already. We hired another person who took us to our hotels in Sydney and paid twice for the same trip. Viator is expected to choose its operators more carefully and not expose us to fraud. Our driver went to the wrong place, so he was 45 minutes late. The correct place was listed on the confirmation. We had to wait almost two hours in the hot sun. I had to wait a bit but the transfer was good.